Please be aware that the weight of a side saddle should be considered for the horse/pony being used, an average side saddle can weigh up to One and a Half Stone more than an astride saddle. The first thing you must ask yourself is do I feel comfortable? Am I sitting straight? Has my saddle a flat seat? Is the leaping head in the right place? If the answer is yes to all these questions and the saddle maintains these properties when being ridden on you have a balanced saddle. Most of the early saddles were made with a dipped seat which was level across the width of the seat. This made the rider sit backwards and tip to the left. To try and stop the rider tipping to the left it is necessary to build up the rear of the (left) near side panel, stuff the top of the off side front and bottom of the near side long point. This will move the saddle over to the right and also slightly rotates the saddle in a clockwise direction. Great care must be taken when doing this as too much stuffing in the wrong place can have the opposite effect and cause damage to the horse's back and the saddle tree. The panels should be a close fit along the horse's back with no bridging (gaps) and sit slightly to the right before the rider gets on. As the rider's weight comes on the panels it should centralise along each side of the horse's spine with plenty of clearance down the gullet of the saddle so as not to pinch or bear down on the horse's spine. The later saddles, especially the Owen's and now the Niedersuss, have the seat built higher on left. This reduces the need for excessive stuffing in the left panel. The position of the leaping head is dependent on the length of the rider's femur (from the back of the knee to the seat bone), the shorter the leg the closer to the front of the saddle it has to be placed. If the leaping head is set too far back the rider will have difficulty in sitting square, as the left hip is forced back. This will also cause the rider to twist in the air when jumping with a forward seat. If a rolled top leaping head is fitted it will be necessary to move the leaping head forward about 1-1½ inches. The rolled top leaping head was produced for Mrs Archer Houblon by Mayhew (see Side Saddle written by Mrs Doreen Archer Houblon 1937). A good test to see if the head is in the right place is to do the rising trot, if you can do this without the leaping head twisting you, it should be about right. It must be remembered that when rising to the trot the stirrup iron should never be used as a means to achieve the rise. Thank you to Roger Philpot for this article. 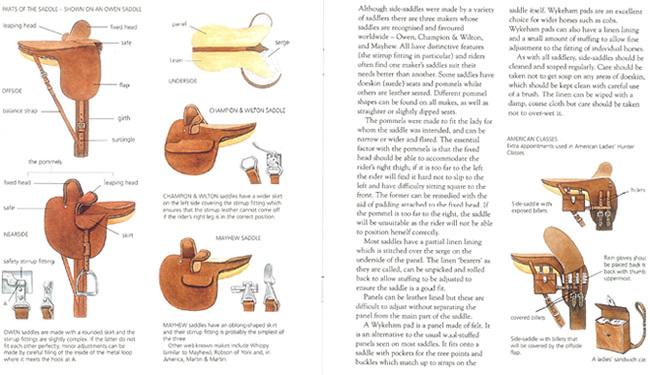 The three most common side saddles are those made by Champion & Wilton, Mayhew and Owen. These saddles can be identified by their stirrup fittings. The pommels are found in various shapes as they were made to fit the individual rider. The fixed head pommel needs to be correctly positioned as it holds the right thigh of the rider; the rider may slip to the left if the pommel itself is positioned too far to the left side, which means the rider may find it difficult to sit straight and square. 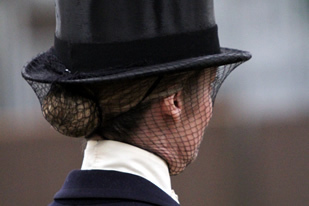 This can be rectified by placing padding around the fixed head; this padding is known as a "queen". Likewise, a fixed pommel positioned too far to the right will not help the rider maintain the correct position. Sitting the saddle too far forwards is a common error which results in the shoulder movement being restricted. The saddle should be positioned behind the horse's right shoulder, with the seat level. From behind your horse the saddle should appear a little higher on the left side; this will compensate for the rider's weight once they are mounted. The balance strap and girth should always be buckled on the left (near) side of the saddle, making sure it is as high as possible on the left (near) side before mounting, as once you are mounted all adjustments are made on the right (off) side. Do not tighten the balance strap as much as the girth as a little movement is required at the back of the saddle to prevent rubbing and a sore back. 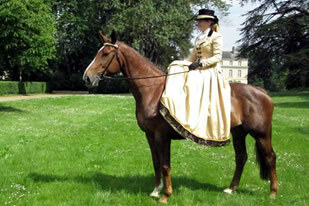 You are advised to seek professional advice when fitting a side saddle for the first time or on a new horse. This is obviously critical and it is vital that you get specialist advice. Side saddles are usually fairly old, so you must be sure they are safe, and fit both you and your horse. Often built for a different type of horse than today's more muscular modern type, the saddle may require work to fit your horse, and this must be done by a saddler who specialises in side saddles. Please note that all information is given in good faith: The Side Saddle Association is unable to give specific recommendation to any commercial concern, and can accept no responsibility if Members/ Non-members are not fully satisfied. The following members of the Society will undertake side-saddle repairs and maintenance. If major work is required on a side-saddle, members are advised to check in advance with the saddler concerned to establish that he/ she will undertake such work. Our list was updated in January 2019. 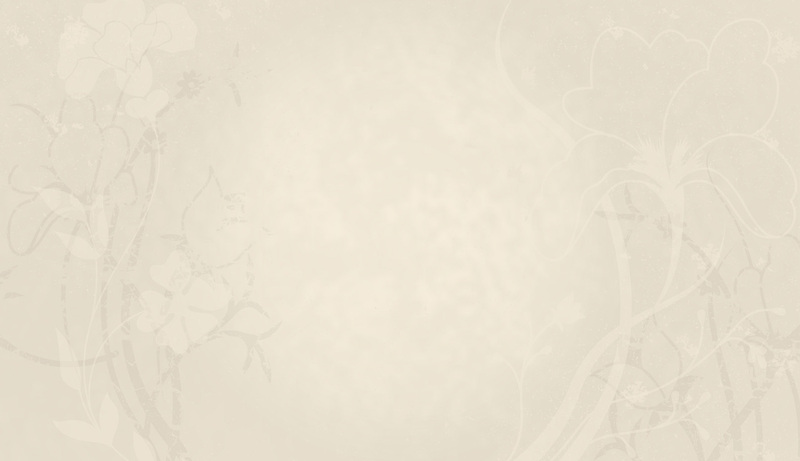 List of Members of the Society of Master Saddlers by courtesy of the Chief Executive, Mrs Hazel Morley. 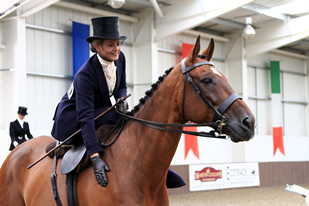 In addition there are some Side Saddle Instructors who sometimes have side saddles available for hire, click here for more details. 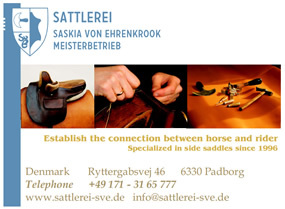 Welcome to Saddlers Corner which features information about Saddlers who specialise in side saddles.